The regular price was more than 33 EUR! For ON-LINE ORDERS click here! 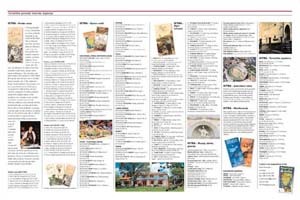 For list of STORES click here! 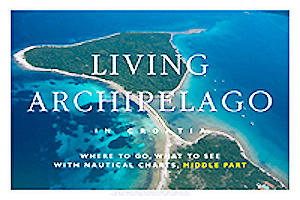 "Living Archipelago in Croatia" is a project led by Julije Skelin, which should help toward bringing the Croatian tourist offer up to the level determined by its remarkable natural potentials. The project is based on an idea of systematic enrichment and development of the existing resources, so as to attract the visitors by its authenticity and power of recognition created during the centuries-old life in these parts. In such atmosphere of hospitality, sincerity and genuiness, any visitor will feel that he has found a part of himself, and will return to it over and over again. 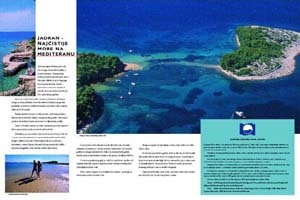 In the informative part of this project, Croatian coast of the Adriatic Sea is presented in three folders, describing its north, middle and south parts. 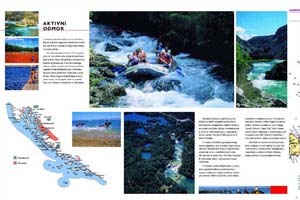 Each folder includes nine charts: The North Adriatic folder is covering the area from Istria to Pag, Middle Adriatic folder from Zadar archipelago to Split, and South Adriatic folder, which is just out of print, includes coast from Split to the southern border of Croatia. All folders are available in English, German, Italian and Croatian languages. First part begins with the presentation of the idea of "Living Archipelago". 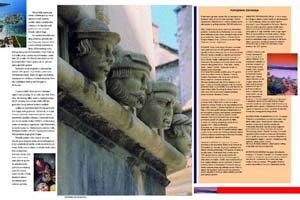 What comes next is a description of Croatia as a maritime country rich in history. After that, several topics are presented which highlight the most captivating parts of Croatian tourist offer in order to attract visitors. 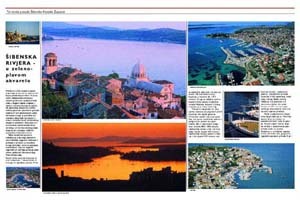 Croatia is described as "Sailing paradise" and the attached chart shows all major marinas and harbours. Under the topic "Active lifestyles" both continental and coastal areas of Croatia are presented. 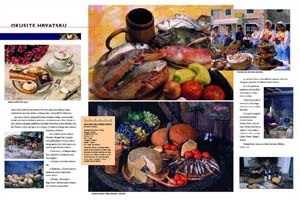 Then come the topics about gastronomy and wines, description of the Adriatic as natural and ecological heritage, and Croatia as a valuable tourist destination. 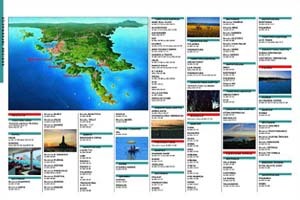 Information about Croatian tourist offices at home and abroad are included, as well as the map showing roads, shipping lines and airports. 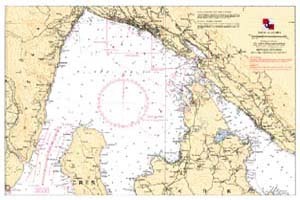 This part also lists all authorized agents that sell nautical charts and publications published by the Croatian Hydrographic Institute in Split. 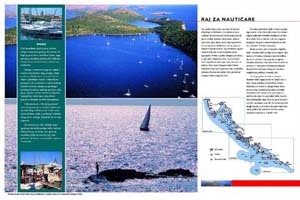 Essential geographic, hydrographic, oceanographic and meteorological information are given, regulations indispensable for mariners when sailing in these waters included, as well as all harbour master's offices and branch harbour offices on the Croatian coast of the Adriatic. 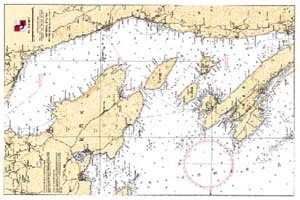 Second part includes nautical charts of 50x35 cm format and 1:100000 scale. 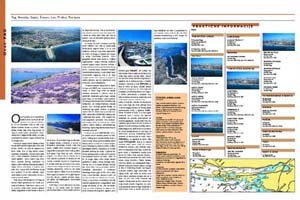 Each chart is accompanied with an interesting description of the area by Swedish sailor and journalist Ebbe Gustafsson, high-quality offer is presented, places and sights worth visiting are recommended. Third part includes useful information on a number of services in tourism available to boaters in this area. At the same time, those who provide services are given an opportunity to promote their offer by advertising in this publication. The offer is presented so as to cover any piece of information that boaters need or to facilitate their search of such information. 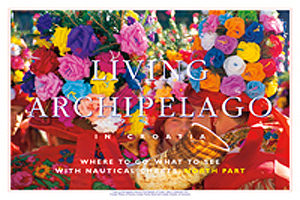 Feel free to write to: livingarchipelago@bulaja.hr. 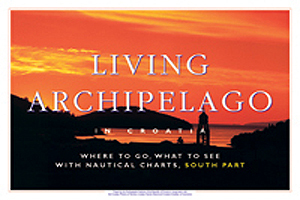 If you visited this page, you are certainly thinking about sailing holidays in Croatia!